Taco Belvedere: "no ship should go down without her captain" UPDATE! "no ship should go down without her captain" UPDATE! Warning, slight spoilers if you read on! Well, last night my most widely available print ever was released. It was an honor to be involved with the premiere of Star Trek Into Darkness and i can't thank the folks at Gallery 1988, Bad Robot and Paramount Pictures, IMAX enough for letting me participate. When I first got the gig and did my initial sketch, I was tasked with doing a glow in the dark image on a film that I hadn't seen and was veiled by secrecy. 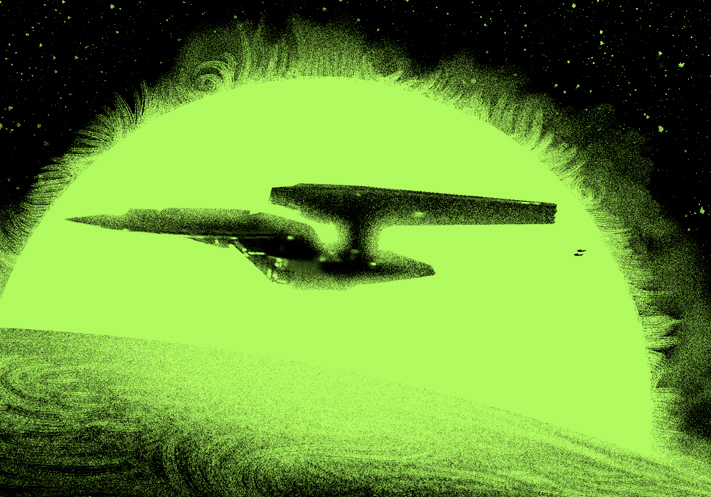 SO, in an attempt to shake some information loose, I submitted the above image for the glow in the dark reveal... that of John Harrison, floating in space, in a stand off with the Enterprise. Needless to say, it didn't get approved. Shortly thereafter, a phone meeting was setup and some key points were described to me. I latched onto a moment in the film that was described to me as the Enterprise facing down a larger version of herself. So, I thought it would be clever to have it revealed that the "hero" Enterprise was actually the "evil" Enterprise when you saw the GID. I hope everyone enjoyed and enjoys the movie as much as I did. I loved every minute and can't wait to see it again! I have a poster but It doesn't seem to glow in the dark is it suppose to? As far as i know, they all glow. It glows man it looks so awesome saw it glowing when I went to sleep last night after seeing the hangover 3 great job on it and hope to see more of you doing IMAX posters!